Access an Overview of your Audience Engagement. When creating your Custom Dashboards, you might want to take a look at your subscriber metrics on an individual level. To add this component, go to Insights > New Dashboard or select a previously created Custom Dashboard > Add Component > Individual Subscriber Metrics. For more info on creating Custom Dashboards check out this help desk article! The Individual Subscriber Metrics Component gives you an overview of your audience preferences & their engagement with your automated newsletters. 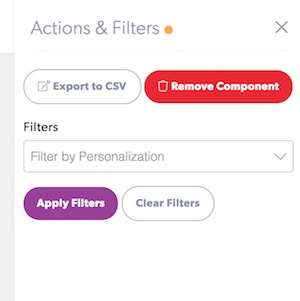 With this component, you are able to identify the list of subscribers who have explicitly personalized their automated newsletters through the onboarding/welcome email.